This past week, my daughter participated in her very first qualifying spelling bee. She was excited and nervous all at the same time! It was a written test and she was relieved when she didn't have to get up in front of a crowd. 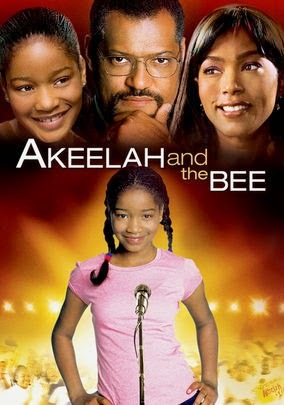 We watched Akeelah and The Bee on Netflix streaming over the summer and she instantly captivated by the story. She has always been a naturally good speller, so I think she could relate to the main character. And last year we missed the cut off to participate in our school's spelling bee. So this year I convinced her to give it a try. She studied hard. We poured over the spelling words in preparation. She made flashcards. We poured over the words together again. Having never participated in a spelling bee or even a qualifying round myself, I didn't quite know what to expect for her. I might have been more nervous than she was! She did so good, only missing two words! However there were other kids who had missed none. So, it was a mini-milestone that came and went rather quickly. She confessed that she was glad she didn't have to stand up in front of an audience. I told her that I was proud of her either way. She is excited to try again next year and cheer on her classmates at the school spelling bee later in the year! I love that Netflix has T.V. Shows and movies to celebrate all of life's mini-milestones. I'm always finding hidden gems in their archives. Whether it's potty training, learning to ride a bike, a first pair of glasses, or a child's first sleepover...Netflix has dozens of titles to help celebrate. You might also want to check out my list of Netflix streaming movies for tween girls. It's a great list for sleepovers or a girl's night in. Disclosure: I excited to be a member of the Netflix #StreamTeam and will be sharing a post a month for the next year on how my family is enjoying using our Netflix subscription. While Netflix has provided me with a complimentary year long Netflix Streaming subscription and a mini iPad to view said Netflix, my husband and I have been Netflix subscribers since 2002. That's 12 years! All opinions are my own and come from my authentic enjoyment of Netflix.